Its no-nonsense design makes it an ideal 'point and shoot' stereo recorder at a great price. Ease of use. Pocket sized. Optional microphone arrays. No option to alter audio speed. The number of portable digital stereo recorders on the market has really grown in the last couple of years. 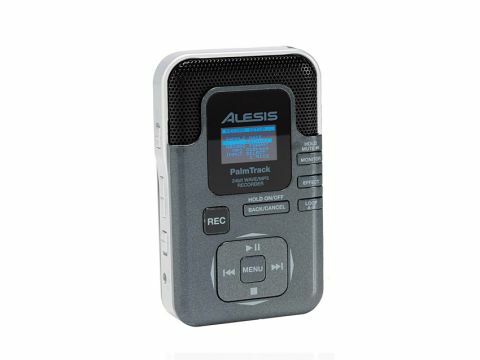 However, the Alesis PalmTrack is slightly different from the norm as it boasts four onboard microphones and is designed to record stereo or four-capsule omni audio in any location. You can choose two-mic or four-mic operation, the latter allowing you to place the PalmTrack in the middle of a rehearsal room to capture sound from all around. External mic or line level signals are also accepted and you can hold the PalmTrack in your hand, place it on a flat surface or attach it to a camera tripod or, via an adapter, to a microphone stand. Operation is very easy - you can be recording within seconds of switching the PalmTrack on, the gain being easily set by a high/low mic gain switch and up and down Record Gain incremental buttons. Onboard processing includes optional vocal enhancement when recording for boosting vocal frequencies and you can treat your recorded audio to bass compensation for reducing the proximity effect in close-mic situations or add chorus, pitch shift, delay or reverb.